This stunning yacht is a true Queen of the seas, built by one of the most legendary companies in the motor yacht realm - the inimitable Ferretti, known for their passion, innovation, and excellence. She€ is capable of accommodating up to eight guests in four staterooms; a Master stateroom with a king size bed, a VIP stateroom with a queen, and two twin cabins. Four crew members ensure that guests experience the ultimate in lavish comfort while on board. 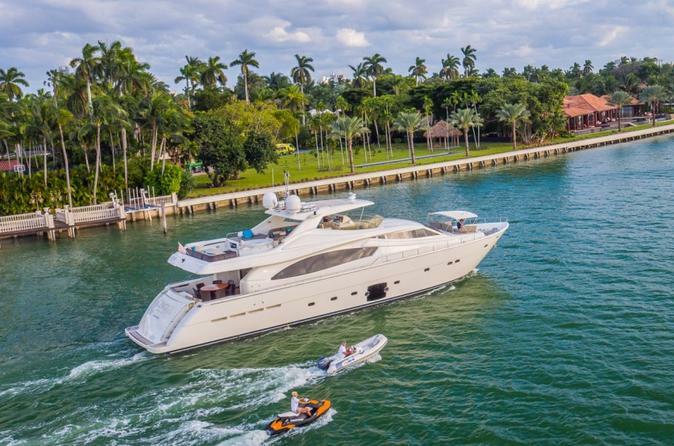 The 88' Ferretti carries a remarkable collection of water toys, including a jet tender, a wave runner, pull tubes, noodles, and other beach games. Of course, guests can also simply relax on the sunbeds, in the hot tub, or in the spacious, well-appointed salon and dining area in the interior. Spend a day on the beautiful Biscayne Bay, where the knowledgeable captains will guide you through the many islands while providing commentary on the scenery. The experienced stewardess is also on board to cater to your every need so you never have to lift a finger. When you are finished learning about the area, drop your anchor and swim or jet ski. All of theÃ‚Â yachts are stocked with popular watersports equipment, and more can be provided depending on your needs. For total relaxation, be sure to contact the supplier beforehand.